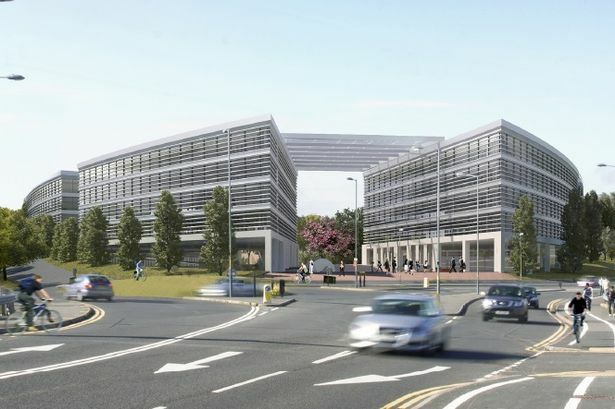 City business chiefs have approved a £5 million grant towards the development of the new life sciences park set to create up to 2,400 jobs on a piece of derelict industrial wasteground. Work to decontaminate the Battery Park site in Selly Oak and prepare it for development has been going on since 2014. But now the development can be stepped up thanks to a £5 million grant from the Greater Birmingham and Solihull Local Enterprise Partnership (LEP). The city council is chipping in a further £10 million over the next three years to see the ten acre site cleared of toxic heavy metals and prepared for development as a life sciences campus - purpose built for cutting edge medical research and manufacturing companies. It is thought particularly suited to life sciences as it is close world class research facilities at both the University of Birmingham and Queen Elizabeth Hospital . The site is next to a major shopping park currently being built by Sainsbury and Land Securities through their Harvest 2 development partnership . Council cabinet member for development Tahir Ali said: “It is expected that the campus will provide up to 2,400 jobs on site and generate a turnover of up to £243 million, in addition to bringing back to life a site that has been left vacant for decades. Development of Battery Park in Selly Oak. According to a report to next week’s council cabinet a developer will be appointed by June to build the campus. The report states that agency Billfinger GVA has been seeking potential occupiers for the site and that ‘the initial finding on demand for space is very positive, with a number of occupier leads being explored’. Construction work on the neighbouring retail park and 18-storey student halls are set to begin this year.